NEW YORK, US - The photo op with Santa Claus has long been a holiday mainstay for American children. But this year, shopping malls in several states are scheduling glamour shots for man's best friend. As the Christmas shopping season kicks into high gear on Black Friday, the day after Thanksgiving, portraits of St. Nick with a family's beloved dog are just one way retailers are looking to attract customers in the face of exploding e-commerce. Brick-and-mortar stores have expanded their bag of tricks – and gotten increasingly bold – as they look to lure shoppers who might otherwise be happy to stay on the couch and pick up gifts while still in their pajamas. The flagship Bloomingdale's store in New York has held yoga classes, and Nordstrom has displayed Tesla cars near the section for men's suits. A number of shops now ply visitors with food and drink. For the holiday shopping season, malls are hosting gingerbread decorating sessions, visits from the Grinch – Dr Seuss's beloved Christmas villain-turned-softie – and ugly Christmas sweater nights. Temporary ice skating rinks and magical winter decor are also being used to draw customers intent on an in-person holiday experience. Walmart Stores plans to throw more than 20,000 "holiday parties" at which children can pose for "selfies with Santa". "All of these retailers are desperate to get people into their stores," said analyst Neil Saunders, managing director of GlobalData Retail, who added a note of caution about all the promotions. "Whether they work or not is open to debate." Most experts predict a solid holiday shopping season, with IHS Markit projecting overall sales growth of 4.2% to about $685 billion, said Chris Christopher, executive director at IHS. Online sales are expected to account for 18.3% of holiday sales this year, up from 16.8% last year, according to IHS. 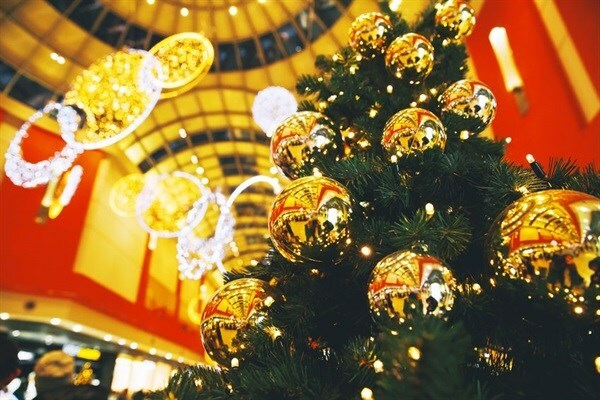 Surveys show that creating a festive holiday atmosphere is one way to prompt consumers to pocket their smartphones for a few hours and hit the mall. About a third of consumers said they enjoyed holiday shopping as a family tradition and 23% said they most enjoy holiday decorations, said a National Retail Federation survey. Tourist Karen Boyd, who was visiting New York this week from Palo Alto, California, said she expects to do half of her shopping online and half of it in stores this year. "The years I've done 100% online, it doesn't feel like you've done your holiday shopping!" she said near Saks Fifth Avenue's famed holiday window display as Christmas carols played in the background. As e-commerce has grabbed bigger market share, chains like Target and Gap have invested heavily in smartphone apps and sophisticated "big data" programs to target consumers and price most effectively. Upscale department store Nordstrom is offering 24-hour curbside pickup at a handful of stores for the final nine days of the shopping season. "Customers increasingly want to shop where, how and when they choose, and 24/7 Curbside Pickup is one service we're offering to support their experience," said Shea Jensen, senior vice president of customer experience at Nordstrom. Department store Kohl's is taking to heart a common motto – if you can't beat them, join them. Kohl's will accept returns of goods bought on Amazon at its stores in Chicago and Los Angeles – and will pack and ship the unpackaged items back to the online behemoth at no charge. The hope is that Amazon shoppers will linger and buy a few items from Kohl's. "We have a really very simple, straightforward objective here, and that is driving traffic is the number one priority we have as a company," chief executive Kevin Mansell said earlier this month. For Saunders, while doggie pics with Santa might draw pet lovers to stores, other initiatives are less inviting. And for him, the real issue is on the product side. "A lot of these retailers aren't delivering what people want," he said. David Simon, chief executive of the mall giant Simon Property Group, said stores should shake up their approach to customer service, highlighting Apple's attentiveness to customers and sleek store design. "I think if they did that in a more comprehensive way through checkouts service, styling ... they would see a pickup in their in-store sales," Simon said on a recent conference call. Shopper Melin Ghotan said "bad customer service" had marred her recent purchase at a video game store – a clerk balked when the Los Angeles mother requested a second shopping bag for the items. "I'd have rather bought it online," she said as she walked near New York's landmark Rockefeller Center.